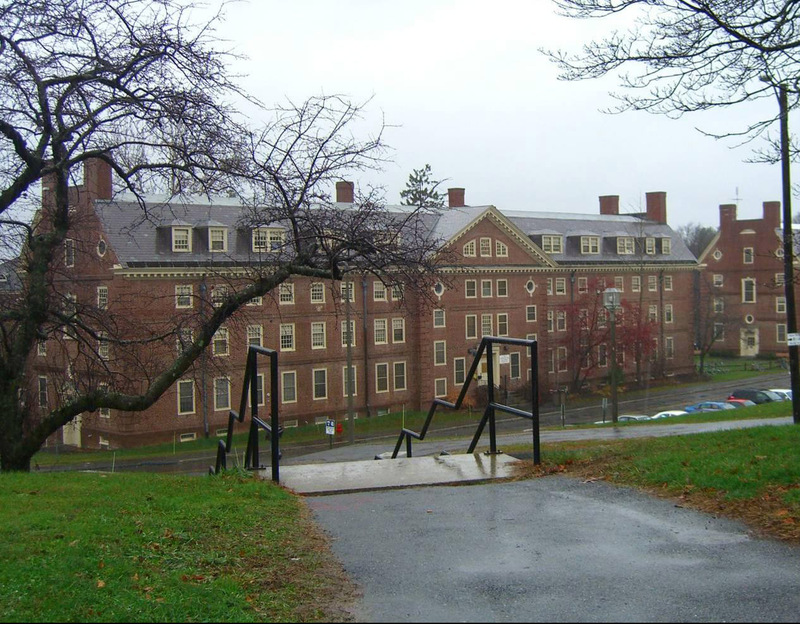 Greenough House is an approximately 37,000 square foot student residence hall on the Amherst campus of the University of Massachusetts. The building is one of nine structures that comprise the Central Residential Area. All nine buildings were designed and constructed between 1940 and 1963, and sited according to a Beaux-Arts formal plan. The rectangular building is 3 ½ stories tall with a basement level exposed by change in grade at the west elevation. The structure is generally 19 bays wide by 3 bays deep. One central cross gable distinguishes the central 5 bays, which project substantially from the main building volume and visually divides the façade into three blocks. The roof eaves of the long elevations are accentuated by a wood dental cornice with returns at the gable ends. Greenough House has a common-bond brick veneer with a molded brick projection to define the basement floor level. Decorative brickwork includes the use of quoins at north and south and to define the projection of the central cross gable. Brick banding also occurs at the floor levels. The façade includes a window pattern of primarily single-hung sash. The muntin patterns progress from the basement level 4/8 to the first floor 12/12, to the second floor 8/12, and finally 8/8 for both the third floor dormers at the mansard roof. The north and south elevations are distinguished by a large 16/16 window at the central bay to illuminate the inter-floor stair landings. This bay also divides the gable-end chimney blocks. Circular radial pane windows with keystones occur at the fourth floor level and first floor stair landing. A similar offset window pattern also occurs to accommodate the interior staircases at the cross gable on the east elevation. Building entrances are regularly located at the central bays of each elevation and feature decorative wood doorcases with paneled thresholds. Exterior granite stairs with wrought-iron railings occur at the east elevation. The building site is located to the north of Clark Hill Road and to the west of Chancellor’s Way on a steep, terraced site. The building defines the northeast edge of a courtyard to the west. To the east, the building is bordered by a bituminous concrete vehicular drive and parking area with granite curb and bituminous concrete sidewalk. Vegetation along the east side of the building between the foundation of the building and the drive includes deciduous and evergreen trees, deciduous and evergreen shrubs, and mown lawn. Concrete steps with a railing provide access to the building from the sidewalk. Wooden benches are located at the southeast corner of the building. Along the west side of the building, a concrete retaining wall with railing provides a level terrace for the building. Bituminous concrete pedestrian walks and lawn are shaded by deciduous and evergreen trees in the courtyard to the west of the building. 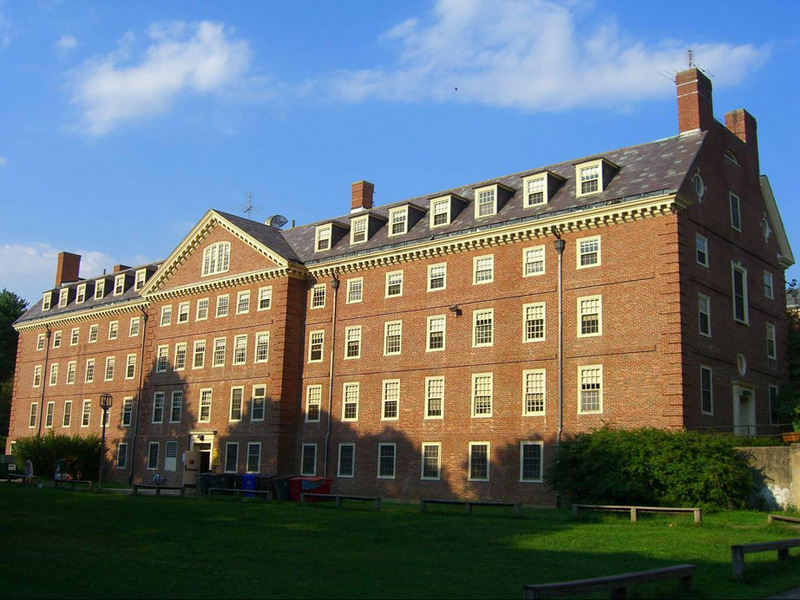 Greenough House was named in 1946 for the eighth Massachusetts Agricultural College President James Carruthers Greenough. Greenough served from 1885 to 1886 and oversaw construction of the Old Chapel, South College and West Experiment Station.